Procure a thin board large enough to cut six blocks, 2 in. wide and 3 in. long; also 2 yd. of cotton tape, 1/4in. wide, and some very small tacks. Cut the board into pieces of the size mentioned, and number two of them on both surfaces, 1, 2, 3, and 4. Cut off three pieces of tape, 4 3/4 in. long, and on the side of block 1 tack one piece of tape in the center at one end, and the other two pieces at each edge on the opposite end, all being on one side of the block as shown. Take the other block and lay the side numbered 4 up, then draw the two strips of tape on the edges of block 1 under it and back to the end of the surface on block 4, and tack them on this surface at the edges as shown. The center tape is passed under block 4 and turned over the opposite end and tacked. This is clearly shown in the sketch. Thus the second block will hang from either end of block 1 by simply folding them together and separating the ends. Mark the sides of the third block 5 and 6, and place it with the two others so that the sides numbered 2, 3, and 5 will be up. Cut off three more pieces of tape, 4 3/4 in. long, and tack them on as shown, being careful not to tack through any of the first three pieces. 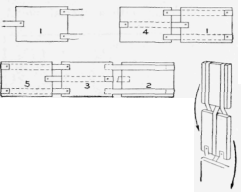 Put on the fourth block in the same manner as the third block was attached to the second, and so on, until all the blocks are attached. Take hold of the first block on the edges and tip it as shown by the arrow. The second block will then fall as shown by the second arrow, and the third block falls away in the same manner, and so on, down to the end. - Contributed by Wayne Nutting, Minneapolis, Minn.